Pentax is a classic imaging company. So you've got to let them have their own crack at an old-school style camera, right? 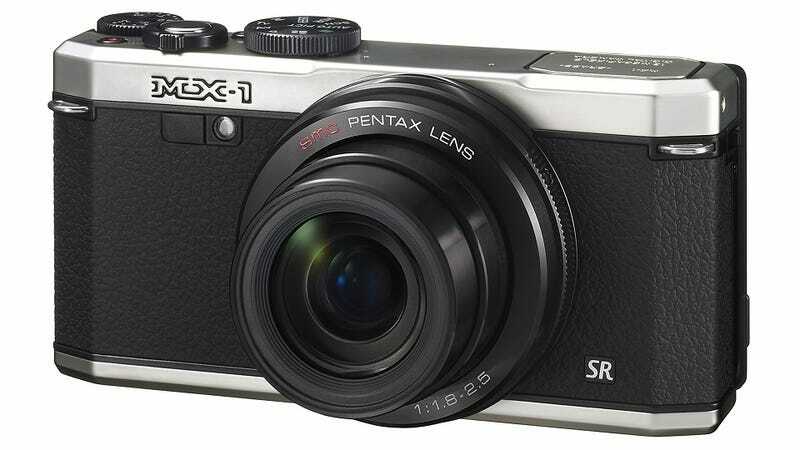 In theory, sure—but the new Pentax MX-1 feel just a little late to the party. Now we've got nothing against the brass-body design, and this $500 point-and-shoot has some undeniably slick features. We love that it's got a super fast f/1.8 lens and some manual controls familiar to the mode dials of DSLRs, like program and aperture or shutter priority modes. And the classic top-panel design with the exposure compensation dial—nice touch! But take a closer look at the camera's specs, like its 12.1-megapixel BSI CMOS. Then you start to realize that it offers a lot less than other models at this price. Companies have been making better manually-controllable point-and-shoots for years at the $500 level. You see, with the retro-styled cameras from Fujifilm, something still feels fresh. In fact, just today, Fujifilm pumped out a refreshed design of two black and silver X-series cameras. Each had the same classic camera bodies as the previous models, but it didn't feel like a played-out gimmick because each was packed with some awesome new imaging technology. What's the justification for picking up the new MX-1? If it's just the design Pentax is selling us—we're not buying. We'll take a closer look the camera this week, and we'll update you when we know more.